The Piney Creek Chapter NSDAR, was organized on December 10, 2004 with 21 members. The name Piney Creek was chosen from the once prominent creek that flowed through this area. In addition to the historic Piney Creek, the Melvin schoolhouse is shown in our chapter logo. It preserves the memory of John G. Melvin, one of the area’s first permanent settlers. For centuries, Native Americans roamed and hunted the land along Piney Creek. Descendants of early settlers recount many tales of the Arapaho Indian camps along its northern bank. They tell how, as children, they scoured the area looking for arrowheads following heavy rains each spring. 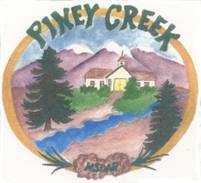 Early settlers arrived in the Piney Creek area around 1859 when gold was discovered in the Rockies. Hoping to strike it rich, thousands of immigrants poured over an ancient Indian trail that traversed Kansas along the Smoky Hill River to the new supply town of Denver. This main “highway” to the gold fields of the Rockies became known as the Smoky Hill Trail. Near the present day city of Limon in Eastern Colorado, this trail divided into three branches. The shortest and the most treacherous route to Denver continued along the trail’s middle branch. One section of this harsh trail followed a stream bed along the north bank of Piney Creek. Until commencement of construction to build a housing subdivision, pronounced trail ruts from the wagons of these early settlers could still be seen. Currently, we have over 80 members, most of them from Centennial, Southeast Aurora, Parker, Foxfield, Castle Pines, Castle Rock, Lone Tree, Highlands Ranch, and Littleton. Out-of-state members participate, too – from Alaska to Connecticut and Florida. The content contained herein does not necessarily represent the position of the NSDAR. Hyperlinks to other sites are not the responsibility of the NSDAR, the state organizations, or individual DAR chapters. Membership inquiries can be made using our Contact Us form. This website was last updated on August 9, 2015 by the webmaster. Unless noted, photos courtesy of chapter members.